The Things I Said I'd Never Do: The Pay is Terrible but the Boss is Cute. The Pay is Terrible but the Boss is Cute. I quit my job before we knew we’d be moving 700 miles north. Our beloved nanny took a “real” job with benefits and that quiet voice in the back of my head upped its volume to a dull roar. Since the day I stepped out of the shower, soap still in my hair, to read “PREGNANT” splayed across the pregnancy test, that little voice started to suggest I be a stay at home mom. For almost 4 years I ignored the voice. I liked my job and had worked out the perfect deal to return part time. It was hard for me to even consider not financially contributing to the household. I silenced it when I started to dislike my job. I told it to shut up when we pulled Max from day care due to frequent fevers, instead opting for a much more expensive nanny. I ignored it when the first nanny moved out of state, giving me the perfect excuse to transition. Then the politics of office life got more intense just as my husband received a promotion. I let the voice get louder, but I wasn’t ready for the change. Finally, life dropped several mini bombs making that voice impossible to ignore. First, another nanny resigned. Three days later my husband was asked to interview for what is now his new job. Even though he hadn’t yet interviewed and I knew nothing about Cincinnati, something in my gut told me it was going to be our new home. I opened my ears and opened my heart. And I quit. So, here I am, almost 2 months after my last days of work. The last two months have been chaotic. It’s been a sea of packing, unpacking, goodbye’s, hello’s, “where the hell did we put the umbrellas” and a week long trip to Disney thrown in the middle. Only now do I feel like I am truly starting my new job as a stay at home mom. That’s how I’m approaching it- as a job. It’s the most important job I’ll ever have. The next few blog posts will be a series of how I’m approaching my new life as a stay-at-home mom. I’m trying to establish some routines and some rules to keep from being that typical stay-at-home mom shown on sitcoms. You know, the ones with oatmeal in her hair, wearing pj’s at noon, throwing her child at her spouse the second they walk through the door. Sure, I’ll have days like that but if I don’t start off on the right foot, every day will be like that. 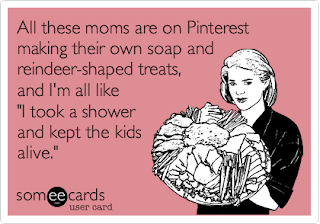 I don’t intend to be a “Pinterest mom”* either. I don’t believe those believe those exist without a closeted prescription drug addiction. Every moment of our day won’t be educational play, handmade high fashion clothing and strictly organic foods. There will be some TV. There will be a lot of Oreos. So come with me as I start this next adventure. I’d love to hear how other moms and dads have made the transition from working parent to being at home. As I write about my rules and schedules, I’d love to hear yours. 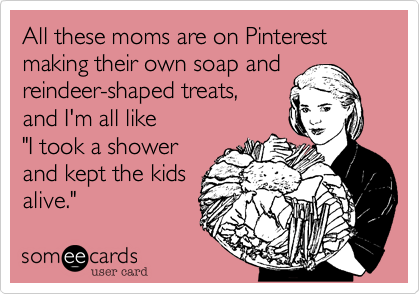 *While this will probably be it’s own blog post later, I actually love Pinterest but I had to consciously work to stop comparing myself to some of the sites it links too. Now I just use it for delicious cookies recipes.